Death can come at any time. No one has ever predicted their own death, but it will happen eventually – no one can prevent it, no matter what our status in life is – it is a fact of life. That is why your close friends will tell you to embrace life, or make decisions that are meaningful and act on your goals no matter how challenging it can be. Lt Col Awadh Saleh Al Kindi, the editor in chief of the Ministry of Interior’s 999 Magazine, recently said that only 10-20% of the people in the UAE had a will and that most did not understand the country´s inheritance laws and its consequences. Dying intestate will result in the bank account and all other assets being frozen until all liabilities have been discharged. A wife with children will only qualify for 1/8ths of his estate according to Sharia. Any joint account will also be frozen. As such it is imperative to have a separate account for both spouses. In my recent post I mentioned a new Will that non-Muslim should take advantage of. It’s called the DIFC Will, which is intended for non-Muslim. 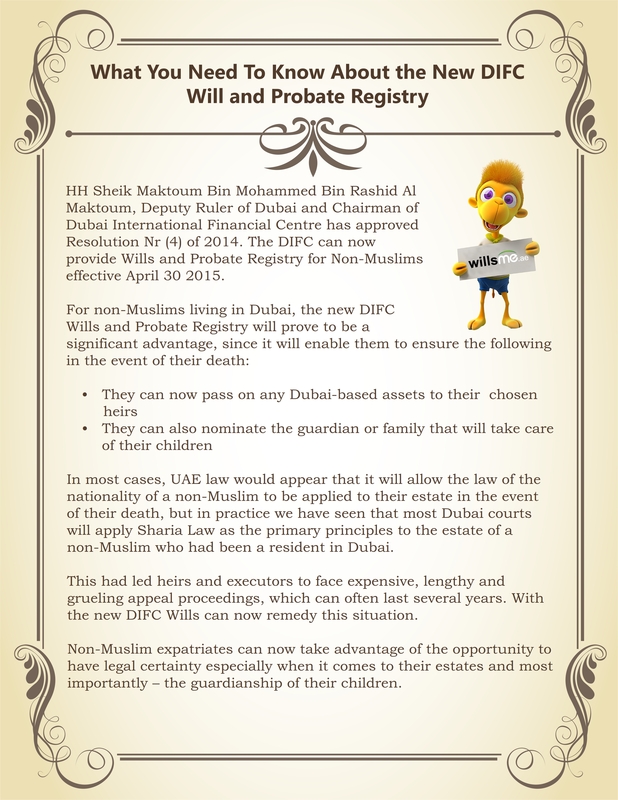 With this new Will non-Muslims can pass any Dubai-based assets to their chosen heirs. They can also nominate the guardian or family that will take care of their children. This is very important as guardianship does not automatically go to the mother. Another point to remember is, a Will needs to address other circumstances such as if you are in a vegetative state. Would you still be willing to stay hooked up to a life-support? What if you’re already brain dead? You can also designate the song to be played and the food to be eaten by the people who will attend your funeral. Many people are very emotional when it comes to writing their wills. They are very specific on various things they want to happen at the end of their life. That is why doctors are honest when it comes to their patient; they know what’s medically possible and what’s not. For this reason, a person writing a will can also specify that if they are a “No-Code,” which means NO CPR should be administered to them, no matter what the circumstance are. We tend to put things off in life, however creating a Will is a must and it is a must do now priority and do not burden your loves ones more than necessary.